Unfortunately, racquetball is not a well-researched sport in comparison to other racquet sports such as tennis or table tennis. Much of the data available regarding calories burned during a game, for example, come from data acquired in the 1980s and 1990s when equipment and gameplay was very different. However, we were delighted to learn of a racquetball study that was recently completed by Mexican LPRT racquetball player and university student Carolina Rivera Luque. Her thesis, as part of her physical therapy degree, was about racquetball injuries. Therefore, we asked her to share a little about what she found. Why were you interested in studying racquetball athletes for your thesis? I became interested in racquetball injuries because of my own experiences. I was a junior champion of the 16U division of the Mexican National Olympics, but I suffered a serious injury. I tore my meniscus not long after obtaining the title, but before the national qualifier for the Junior World Championships. I got injured during preseason training, but I was not the only one who was injured; I saw several other players get injured before, during, and after tournaments. I began to wonder whether there was something wrong with how racquetball players were training for tournaments. I also questioned whether playing so many matches in such a short period of time also affected injury rates. I was not sure if it was due to the biomechanics of the swing or something else. I did some research on racquetball injuries and found very little information. I found articles describing ocular (eye) injuries but not much else. However, I knew from researching other sports such as soccer that the prevalence and incidence of injuries depends on position, the number of hours of practice and games per week, weaknesses in the muscles, and other things. But there was no data or information on the injuries that occur in racquetball. Who did you study? Tell us a little bit about your methodology. I actually started my investigation in 2016 and interviewed athletes that had experienced injuries. I chose racquetball athletes in the 16 and under division (born in 1999 or 2000). I chose this group because I had noted that it is at about this age where players start having pain or injuries that affect their training. At this age, athletes are training much harder and play more tournaments per year. This age group is part of the Pan-American Games, Junior World Championships, and National Championships. They also compete in a variety of other open tournaments around the country. The book Total Training for Junior Champions by Tudor Bompa presents training guidelines and goals oriented to specific age groups and sports. It also considering gender differences along puberty. He emphasizes the importance of tailoring programs to maturational levels instead of chronological ages. Bompa addresses all phases of development, including prepuberty—the period of initiation; puberty—the phase of athletic formation; and post puberty—the time of specialization. He mentions maturation, which is associated with elite athletic phase. One of the main problems with injuries in adolescents is that early specialization violates the mutilaterality principle (which is the first phase, development phase in which the child should be able to develop skill proficiency across multiple areas: balance and agility while rolling, throwing, kicking, catching, ducking, jumping, crawling, dribbling, etcetera). During the athletic formation phase, which takes place from 12-16, girls find themselves in an extreme hormonal experience, and many studies have noted an association between capsular and ligament distention during the premenstrual phase of the cycle. This requires restructuring training programs, especially mesocycles that can be adapted to the progesterone and estrogen phases of the menstrual cycle. For instance, trainers should consider implementing more coordinative skills training, technique, stretching, and proprioception during their PMS instead of a power training program that may injure ligaments or muscles; laxity increases significantly throughout the menstrual cycle when comparing baseline with peak levels of estrogen and progesterone. Other injuries at this age may be associated with growth development. Such an example is Osgood Schlatter’s disease, which is a painful, bony growth that occurs on the shinbone just below the knee often during puberty. This is also a very prevalent disorder in youth that train in high impact sports (e.g., basketball, volleyball, soccer, jumping, running) along with early maturation of bone epiphysis because of the over stimulation and load on the femur, tibia, humerus, radius, etc. Many authors agree that youth under 15 are still developing basic skills and skipping this psychomotricity step can generate dysfunctions and complications or even “burn out” the athlete when trying to develop a more complex skill such as a racquetball swing. In other words, this is an age where young athletes are training more, competing more, but are still developing their physical and mental skills. The injury history said that most righties have more injuries on their right side and the lefties have more injuries on their left side. This suggests the dominance of a cross chain overuse or may be an imbalance in the muscle length-strength relationship (this is one of the things I would like to study specifically) during the swing of the righties during their forehand motion (weight transfer to the left leg, torsion of the hips, thorax and scapular waist/shoulder twist). In the case of lefties, the over use of the arm, elbow, and wrist points to be the most important issue and their sustentation base during the swing seemed to be the main problem related to their leg. In the righties, the issues were with their left knee, ankle and thigh, but the upper body (arms, elbow, wrist, hand) injuries in the righties took place on the right side. Those who were left-handed (7 athletes) experienced more injuries on their left side and reported more pain in general on that side. It is my hypothesis that left-handed players are over using their lower left limb (legs) to execute their back hand. In comparison, I discovered that right handed players put too much demand on their legs during serves and forehands which cause lower extremity injuries such as knee pain during and after competition, muscle tears, and ankle sprains. I also found that those with ankle sprains experienced a repetitive incidence of the injury; once they experienced a sprain, they often sprained it more than once. This suggests that rehabilitation and strengthening of the injured joint is not taking place and should be implemented as a preventative procedure. Seven surgeries were reported, but only four were muscle skeletal and significantly impacted their training. All were treated with physical therapy. The only surgery related indirectly to racquetball was the knee surgery due to gonarthrosis (chondromalacia patellae). Interestingly, only 7 out of the 72 non-surgical injuries were treated with physical therapy. Our culture has not taught most of the community the algorithm of re-integration to sports after an injury. Here is where I would like to intervene with an active rest protocol and a more specific physical therapy intervention that will lead to a functional recovery, reinforcement, and probable adjustments of the technical aspects of the basic skills on their everyday activities and specific racquetball movements. Do you think there are more or less injuries in racquetball than other similar sports like tennis? As part of my study, I researched other racquet sports such as badminton, table tennis, and squash. There were reports of injuries in the lower back, shoulder impingement, and knees. This data coincides with the finding of my study. There were also several reports on pathologies specific to a sport such as golfer's elbow. I did an evaluation of injuries in table tennis and found that the Cuban national team reported more injuries in the upper limbs. This might be expected because table tennis does not require as much movement across space compared to racquetball. As an athlete, what could I do to help prevent some of the injuries that you reported? For those competing, I strongly recommend having annual sports medicine or physical therapy evaluations. Having coaching or a certified trainer to help athletes in this area is also highly recommended. In my opinion, no matter the sport, everyone should begin activity with a complete warm up. This should include a focus on strength, balance, core activation, and flexibility before practicing. Athletes should complete functional movement that uses correct form. For that you need core stability and strength. There must be a balance between flexibility and strength of the main muscle groups, and I recommend dedicating at least two sessions a week for flexibility training. Flexibility training should not be done on the same day as strength training. When strength training, train isolated muscles with negative phases. In other words, control how you return the muscle to its relaxed phase. Too many people make a big effort during the concentric movement (e.g., jumping) but pay no attention to the eccentric movement (e.g., landing) which is statistically the main mechanism of injuries and the instability in this phase along with the muscle weakness-tightness relationship (agonist shortening subsequently generates unhealthy elongations in the antagonist groups and therefore a compensation because of the body’s tensegrity model). What do you want to explore next? I would like to do a study investigating the injuries of professional players and compare them to other sports and other levels. I would also like to evaluate pain zones during practice or competition and compare it to an athlete’s hours of training and the number of tournaments in which they compete. Eventually, I would like to develop injury prevention programs and rehabilitation protocols that are racquetball specific. I would like to investigate the impact of the vibrations in the tendons, core and scapular stability, and eventually use biomechanical analysis to aid in the development of safe and effective fundamental swing and movement pattern technique in racquetball. I would like to promote health and sports in my community, organize talks for patient education and forums where we can dialogue about what can be improved in our performance and training without risking the health of the athletes. I am planning to assist at the Junior World Championships this year and my hope is that the National Federation will allow me to interview and assess these junior athletes to continue building on the data that I already have. Doing so will allow me to continue targeting areas for improvement in the sport when it comes to injury prevention and rehabilitation. 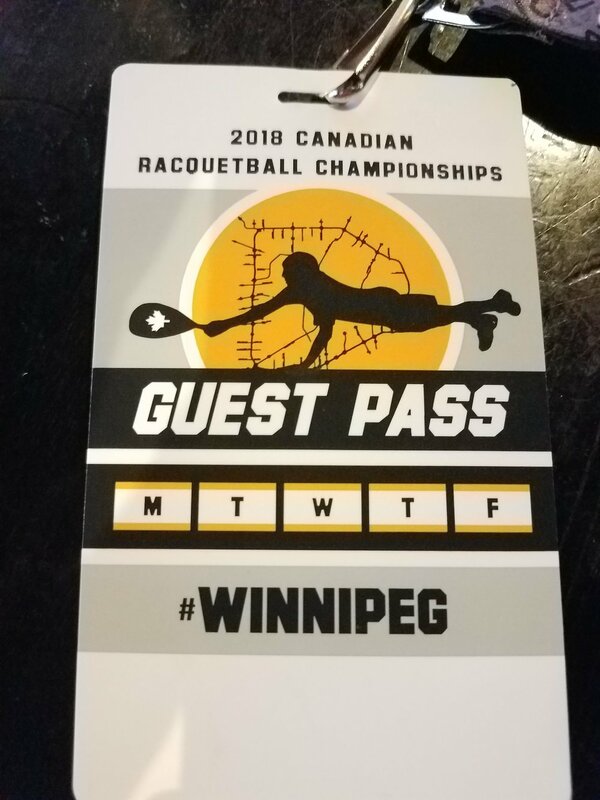 A few short weeks ago, I (Tim Baghurst) was kindly invited by Racquetball Canada to stream their national championships. For me, it was a unique opportunity to see some different players, but to also see how the tournament was run differently to the state, national, and international tournaments I have attended over the past several years. After eight days and over thirty matches streamed, I learned a lot. In this short article, I highlight some administrative observations that would be of interest to those organizing and operating tournaments, and I also share some points that may assist those athletes who are looking for small differences that might help them at tournaments and during tournament play. National championships are lengthy affairs and last several days. The Canadian National Championships include both singles and doubles within one larger tournament. I can see the value in this. Trips such as these are expensive, and to complete both singles and doubles in one event is likely more cost effective for players than two separate events even if it is longer. The doubles tournament preceded the singles tournament, and most players remained for both. For some, playing doubles before their singles tournament allowed them to acclimatize to the courts and environment. It was perceived as an opportunity to prepare for singles, which they considered more important. However, doubles first can also present problems. In doubles, players typically hit a lot more balls even if they do less running. In addition, and in the unfortunate case for at least one player in the gold division, injuries can occur. The physical toll can affect performances in singles. It would be interesting to evaluate which division players prefer to compete in first, and it is my understanding that Racquetball Canada will be doing a survey of the athletes who were part of this event. Market research is a valuable asset in ensuring the best product is produced. The tournament desk included a whiteboard on which all upcoming matches and their assigned courts were written. This made it very easy for players to know which court they would be playing on. It also informed fans which court they should be watching. With any tournament, the provision of food can be problematic. If a tournament director is providing food, it is offered within a certain time frame, and when it is gone, it is gone. This is an issue for those playing during this time. Also, there are those who paid for food through their entry but are not coming to the courts just to eat when their match is hours later. In this tournament, the players were provided lunch at a local restaurant on a special menu with about eight food options over a five hour period (11am to 4pm) . This removed the complications of bringing food into the facility, but also allowed athletes different choices each day depending on their tastes and nutritional needs. A similar process occurs at the IRF Senior World Championships. In Canadian Racquetball rules, players must win by two clear points. The purpose of this policy is to remove the lucky bounce, so to speak, that determines a match. However, to win a tiebreaker 11-10, for example, the player must still win two rallies. Although there were one or two exciting finishes (e.g., 15-13), winning by two clear points may take away the drama of players winning by a single point. In collegiate tennis, for example, players no longer earn “advantage” and then an additional winning point after deuce. Rather, at 40-40, the next rally wins. This makes those rallies extremely dramatic. Winning by one or two clear points is a debatable issue; perhaps two points is the preference of the athlete and one point the preference of the fan. Some players arrived the night before the tournament began. For some, this was a long car journey, which can be fatiguing and affect other areas such as hydration and nutrition. However, perhaps even more concerning is that by arriving late, some players did not have an opportunity to practice or hit on the courts prior to the beginning of the tournament. From a performance standpoint, these small issues can be the difference in success or failure. In a single elimination tournament, players must be prepared to perform from the first rally. Racquetball Canada use the Olympic format (Gold, Red, Blue, & White) in some situations, and in others a round robin format is applied. Either way, one loose game or match can affect medal chances. The tournament provided a warm up and cool down area for players. It was interesting to note that while some players did warm up stretch and subsequently cool down and stretch after their match, others did not. There is plenty of evidence to support the value of these aspects of performance, and those interested in transitioning from an athlete to professional should consider adopting these practices into both their training and competition. During the tournament, the weather was quite humid, and the courts became slick as a result. In the final of the men’s singles, for example, a 15-minute break occurred before the tiebreaker to allow the court to be dried. There were numerous wet ball calls throughout the week, and some players struggled to handle the situation more than others. These circumstances occur during competition, and players must learn to accept difficult or unexpected situations (e.g., not being able to hit a specific serve because it is consistently being called a wet ball) and adapt accordingly without letting it interfere with their mindset. Timeouts are an integral part of many sports, and allow the athlete or team an opportunity to regroup or halt the momentum of the opposition. Do they work? More often than not, they do. If they did not, players and coaches in the sports that permit them would not use them so often. In the 60+ games of racquetball I watched, less than 10 of those games included the full use of timeouts by the losing player. Of course, this is not an issue specific to Canadian players, but it was very evident at this tournament. Furthermore, it was interesting to note that players were less likely to take timeouts during doubles matches. Timeouts are a valuable asset and should be used when available and needed. Attending any tournament provides us all with an opportunity to learn. For those who do run tournaments or have such aspirations, attending another director’s tournament provides opportunities to learn best practices. For coaches and athletes, observing the routines, habits, and methods of other amateurs and professionals provide opportunities to learn and grow. Next time you go to a tournament, try seeing instead of just watching. 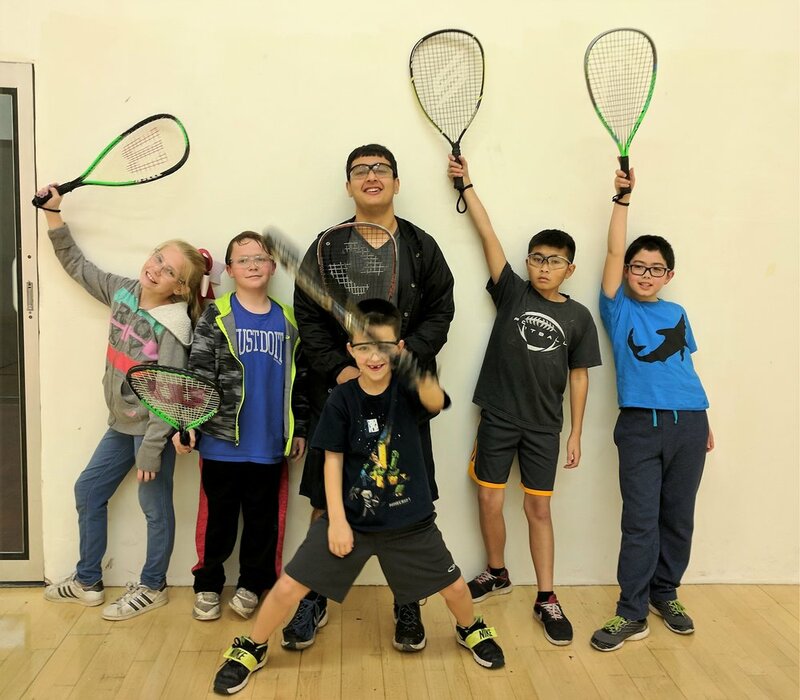 About two years ago, the Reaching Your Dream Foundation created a program that promotes healthy opportunities for youth, particularly through racquetball. It was branded “Fitness Forever” and was formally introduced to the Stockton California area by USA Racquetball Team Coach, Dave Ellis, along with others including his well-known son and ex-professional player John Ellis. Now the program is more fully developed and growing as described below, including a discussion of a partnership with the USAR. For more information on the program, please visit https://www.reachingyourdreamfoundation.org/fitness-forever. Dream It – Fitness Forever Program - Empowers communities by providing opportunities for youth & families to experience fun, friendship, and lifetime health and fitness through participation in racquet sports. Reach It – The Dream Team - Provides emerging professional racquet sport athletes with financial support, mentoring, and career development opportunities to achieve success on the court and in their life. Live It – Athlete to Professional - Uses experts across disciplines to provide knowledge, skills, tools, and practices to improve performance, build a successful career on and off the court, and give back to the community. 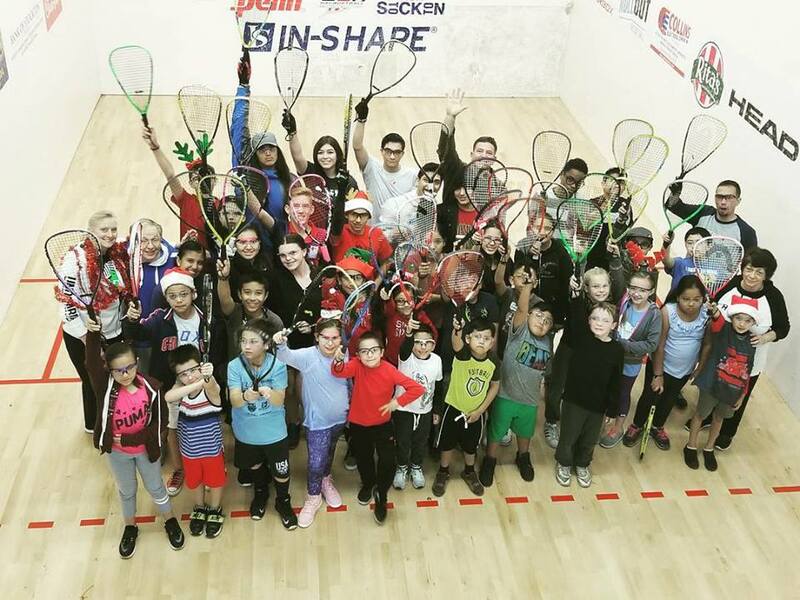 There is a revival of junior racquetball happening in Northern California. The Stockton Junior Program, led by Jody Nance, John Ellis, and USA Head Coach Dave Ellis has flourished, with regular attendance in the 40’s on a weekly basis. Emerging from this success, with the help of the Reaching Your Dream Foundation, John and Dave have been working to establish junior programs in other areas throughout the Northern California region. In addition to Stockton, programs have been established in Fairfield, Modesto, Lodi, Antioch, Fresno, Merced, and Livermore. Other locations under development include Shingle Springs, Alameda, and Santa Rosa. Now more than ever, the racquetball industry is facing a critical issue as many racquetball courts are being converted for a variety of other uses. This phenomenon is worrisome to lifelong dedicated players. In protest to the developing crisis, Dave explains that, “If we are going to preserve racquetball for future generations, we all need to work together to SOC (save our courts).” Furthermore, John and Dave suggest that, “Successful junior programs will bring memberships and publicity for clubs in general.” Therefore, this current article reveals what it takes to have an ongoing junior program because sound junior programs are essential to the resurgence of our sport. 3. Components of a successful junior program. At the end of Phase I, all in attendance are encouraged to return after a two-week period with as many potential junior players as possible. The purpose of Phase I is not to motivate juniors but rather adults at the club in hopes to establish an ongoing junior program. Programs from other sports have many adult volunteers who work with juniors. Little League Baseball, Pop Warner Football, and Catholic Youth Basketball are well known examples. 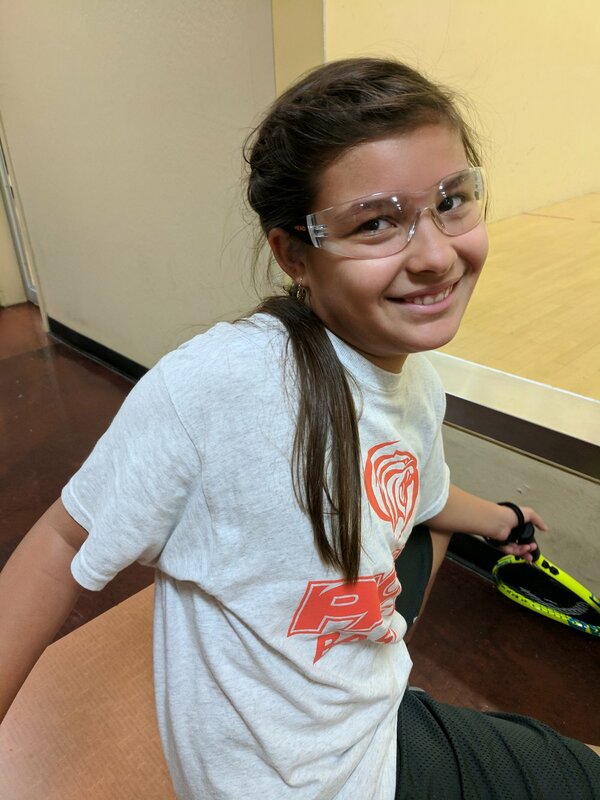 Therefore, the goal of Phase I is to follow a similar model by encouraging adults interested in racquetball to help promote the sport to youth. 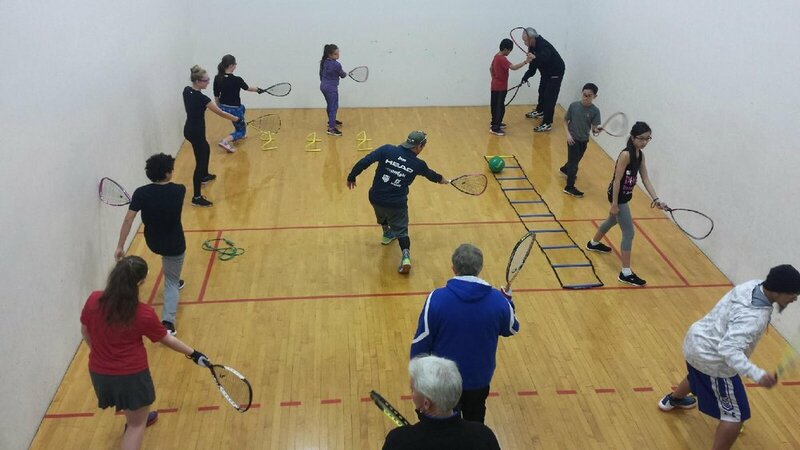 Two weeks after the Phase I presentation, John, Dave, and some volunteer juniors will return to the club to present Phase II, an on-court demonstration of a junior class. During this 60-90 minute period, different types of junior activities will be presented. Examples will include activities that range from those for beginners (some as young as 6 years old), to advanced drills and strategies for experienced junior players. A lengthy catalogue of activities is given to the “Team” of adults in attendance. This growth cannot be attained without adult volunteers, and Dave and John believe it is the personal connections they make that help convince people to volunteer their time and energy. Although materials and content for programming is important, the volunteer ultimately drives the success or failure of a program. An individual that will take care of ensuring that parents/guardians sign consent forms for liability and pictures. · It is important that we all join in the fight against obesity. · When there are junior players that love the game, parents will tend to join the club. · Knowing that you will be helping to SOC – will be satisfying. · At the end of Phase 1, eight racquets, six eye guards, and two dozen balls are left to the leaders. If you are interested in starting a successful junior program at your club, please email John Ellis (ellistyle@comcast.net) or Dave Ellis (DAVEELLIS665@comcast.net). There would be no charge to have John and Dave consult with you and your club to work with you to establish a successful junior program.